I pretend to be intelligent in some situations, but deep down I feel stupid sometimes. That’s my emotional intelligence talking. When people talk about intelligence, they usually refer to the traditional IQ. But I want to discuss the other intelligence which may be a better predictor of your success — Emotional Intelligence. Emotional intelligence saved my life. But I wasn’t naturally good at it. In fact, I wasn’t good at anything. I had zero talent, an average mind and I grew up in a normal household. The point is… I decided to get better. I chose to develop myself. Developing emotional intelligence changed the trajectory of my life. Without it, I’d probably be living like a zombie. Today, I will cover everything you need to know about mastering emotions to increase your success and happiness rate. But before we begin, understand this: Emotional intelligence (EI) is a skill which you can train to improve. So no matter how good or bad you are at EI, you can improve. By the end of the post, you’ll be a more emotionally intelligent person without a doubt. Emotional Intelligence is the capacity to be aware of, control and express one’s emotions, and to handle interpersonal relationships judiciously and empathetically. Scientifically, emotional intelligence is involved in the activities of the brain regions that process emotion. There are two kinds of emotional intelligence — Intrapersonal and Interpersonal intelligence. Intrapersonal Intelligence is about understanding, acknowledging and regulating your own feelings, motivations, and fears. Interpersonal Intelligence is about understanding, acknowledging and regulating the emotions of others. Success in the career is a lot about dealing with other people. If a company is filled with high EI people, not only does it contribute to company success, it creates a better work environment and the employees stay happy. And when employees are happy, customers are likely to stay happy. One of the most common reasons most relationships fail is because of low emotional intelligence. People with low EI find it hard to manage themselves or understand others. Building relationships is a two-way street. So first, raise your own EI and then find a person who has a good EI too. When two people with good EI are compatible, the relationship works like a charm. Combine two incompatible people with low EI and you’re almost sure to find a relationship crisis. There’s another crucial thing you must keep in mind. Emotional Intelligence is a power. One can use it for good or bad. It comes down to your own ethics. When one person has high EI and the other has low EI in a relationship, the person with high EI may manipulate or take advantage of the person with low EI. So the best bet is that we all raise our EI and use our power for the good. Among all relationships, the best relationship is the one you have with yourself. No relationship can be healthy if you have a toxic relationship with yourself. Emotional intelligence helps you understand and manage yourself. The more you understand yourself, the more differences you recognize in others. This helps you understand others and meet them where they are. So, help yourself before you go on to help others. Of course, you must not be selfish or self-absorbed that you become indifferent about others. There is a delicate balance between putting yourself first and not making everything about you. That’s where emotional intelligence can help you draw the line. When you’re able to monitor the unpleasant feelings, you can take actions to feel happy, calm and confident. A lot of times, we depend on outside events to bring us joy, peace, and confidence. While it’s good to celebrate positive events in life, if you keep depending on these events, you’ll find yourself sad, bored, depressed, angry, upset, annoyed, etc. in your default state. With high emotional intelligence, you can switch your default state because of your ability to regulate emotions. Through mindfulness and taking the right actions, you can become focused, relaxed, happy, confident, and enthusiastic on command. So far, there are five main models of emotional intelligence named — the Ability Model, Mixed Model, Trait Model, Bar-On Model, and the Genos Model. For the sake of simplicity, let’s explore the Mixed Model which was introduced by Daniel Goleman, who is also the author of the book Emotional Intelligence: Why It Can Matter More Than IQ. 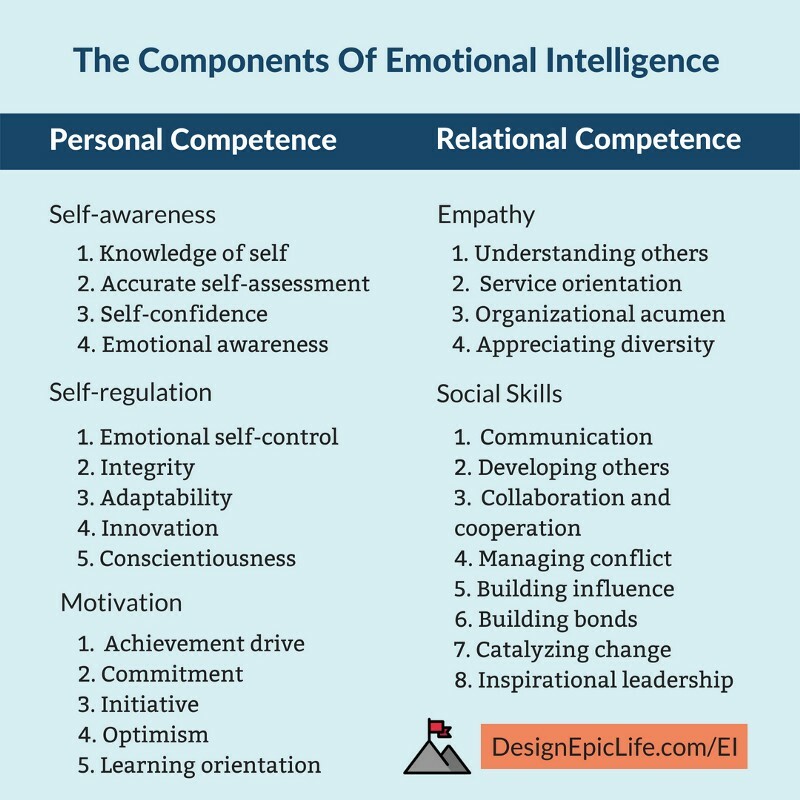 There are five components of emotional intelligence — self-awareness, self-regulation, motivation, empathy, and social skills. 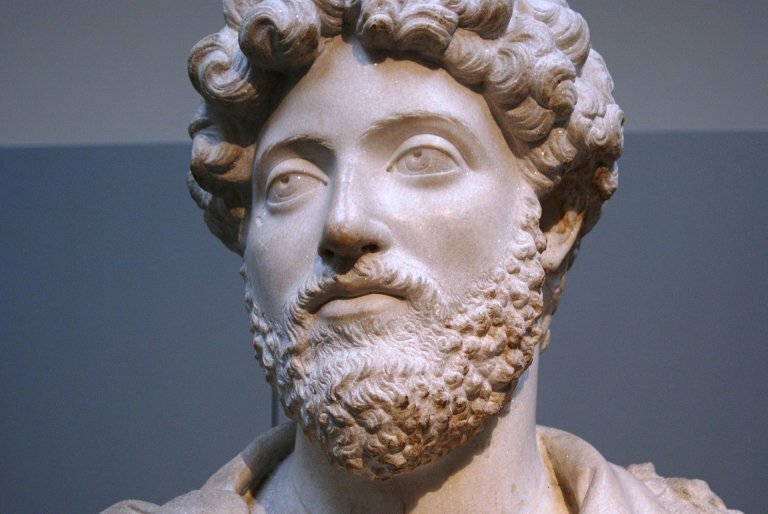 a) Knowledge of self: Knowing all aspects of self, including emotions, values, and personality, and recognizing their impact; using “gut instincts” to guide actions. b) Accurate self-assessment: Accurately perceiving strengths and weaknesses, and your role in interactions, in ways that line up with others’ views. c) Self-confidence: Strong sense of one’s self-worth and capabilities. d) Emotional awareness: Knowing different types of emotions and acknowledging when you feel them. a) Emotional self-control: Managing one’s managing impulsive or distressing feelings so that they don’t leave a negative impact on others or yourself. b) Integrity: Maintaining standards of honesty; speaking and acting in alignment with values; taking responsibility for personal performance; being trustworthy. c) Adaptability: Demonstrating flexibility in adapting to changing situations or overcoming obstacles; being resilient. d) Innovation: Being comfortable with novel ideas and approaches; being creative. e) Conscientiousness: Doing your work well and thoroughly; being efficient, organized and careful. a) Achievement drive: Striving to meet a standard of excellence; having the ability to set and achieve goals; persistence and sustainability. b) Commitment: Being able to commit and follow through; keeping your words. c) Initiative: Ability and willingness to identify solutions and act on opportunities. d) Optimism: Keep a positive attitude even when the going gets tough. e) Learning orientation: Commitment to continual learning and improvement. a) Understanding others: Accurately sensing and understanding others’ emotions; taking an active interest in their needs and concerns. b) Service orientation: Anticipating and meeting the needs of others; contributing to the common good. c) Organizational acumen: Reading the forces that shape the organization, including power, influence, values, and external pressures. d) Appreciating diversity: Valuing the contributions of a wide range of people; understanding the influences of various factors, including race, gender, economic background, nationality, etc. a) Communication: Hearing and listening to others; sending and receiving messages accurately. b) Developing others: Sensing others’ developmental needs; enhancing others’ abilities through feedback and coaching. c) Collaboration and cooperation: Creating group synergy by pursuing collective goals. d) Managing conflict: Negotiating and resolving disagreements; facilitating others to move through conflict. e) Building influence: Identifying and nurturing instrumental relationships; effectively persuading others. f) Building bonds: Nurturing relationships and connecting with others. g) Catalyzing change: Initiating, designing, and facilitating change and new directions. g) Inspirational leadership: Guiding and motivating others through a compelling vision; aligning the goals and strategies of the organization. Like any other skill, it takes time and practice to develop emotional intelligence. But first, you must have a growth mindset and believe that you can improve your EI no matter where you start from. And there is no limit to how much you can improve your emotional intelligence. There are tons of personality quizzes out there. You’ve probably taken some already. While there are a lot of theories on personality traits, the “Big 5” personality traits theory is wildly researched and is often talked about. The five traits are — openness to experience, conscientiousness, extraversion, agreeableness, and neuroticism. You can easily remember the five personality traits with the acronym OCEAN. Openness to experience: The scale of how creative and adventurous one is. Conscientiousness: The scale of how organized and mindful one is. Extraversion: The scale of how outgoing or reserved one is. Extroverts gain energy in social situations while introverts gain energy in solitude. Agreeableness: The scale of how cooperative and prosocial one is. Neuroticism: The scale of how emotionally resilient and stable one is. Once you understand your traits, it becomes easier to accept or change yourself. You also become more understanding and accommodating to others’ behaviors. Wisdom and Knowledge: creativity, curiosity, judgment, love of learning, perspective. Courage: bravery, perseverance, honesty, zest. Humanity: love, kindness, social intelligence. Temperance: forgiveness, humility, prudence, self-regulation. Transcendence: appreciation of beauty and excellence, gratitude, hope, humor, spirituality. While humans do have similar basic needs, we all want different things and have different beliefs and values. The worst is when you chase others desires, copy others beliefs (without a conscious thought) and don’t stay true to your values. To overcome this lethal situation, take the time to set your values, beliefs, and goals. In his book, Awaken The Giant Within, Tony Robbins suggests two kinds of values — end values and means values. When choosing your values, try to select the end values as opposed to means values. End values refer to what you ultimately want, whereas means values are the ways to achieve the end values. Freedom, growth, peace, love, impact, abundance, vitality are examples of end values. While money, health, relationships, fame, knowledge are examples of means values. When you focus on your end values, you reach your means values along the way. Once you’ve chosen your values, define each one in your own words with as much detail as possible. The clearer your definition, the more you will stick to your values and direct your energy towards them. And don’t worry, you can always change your values as you evolve. So pick your current values and stay true to yourself. If you struggle to find your end values, ask yourself why you want to reach your means values at least 5 times. For example, when I started my website Design Epic Life, it took me 6 whys to find the ultimate answer I needed to start the website and keep the vision in mind. While there were many reasons to start the website. The final and the most appealing reason was that I believe that every person should celebrate their only life in the limited time we have. By “celebrate”, I meant designing a life that fits your definition of success. Once you define your values, it’s time to define what you believe in. It doesn’t matter if you’re a religious person or not. You don’t need to reason your beliefs. They are simply there to help you and others live a better life. There are a lot of religions or philosophies that have a set of beliefs you can follow or take inspiration from. Personally, I don’t follow any religion but I like to get inspired by different ideas. You can start with optimism. The ability to look at the bright side and derive meaning from hard events can help you get through and trust the process of life. But your job doesn’t end there. If you believe in optimism, try to spread the vibe on other people without forcing your beliefs on others. It’s not always easy to notice these signs when you’re living on autopilot. A lot of times, we experience what psychologist Daniel Goleman calls Amygdala Hijack. 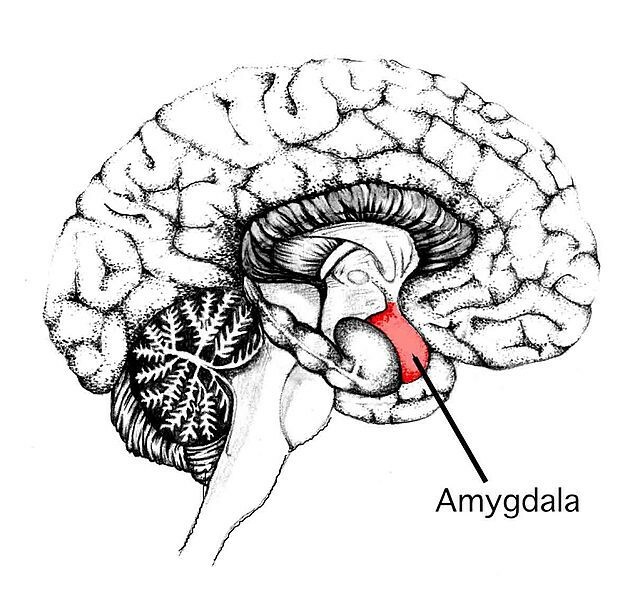 Amygdala is the region in the brain that is responsible for processing emotions. When it’s hijacked, your pre-frontal cortex shuts off ( which is responsible for cognition). Your amygdala region activates to light up fear and you go into the fight-or-flight response. This phenomenon helped us survive in the past, but today, it often gets us into trouble. a) After a hijack, analyze the situation by thinking alone, journaling, or talking to yourself. For example, if you burst in anger in a situation, find out what really irritated you. Were you not being heard or understood? Was someone acting against your values? Was something coming in your way of what you wanted to do? b) Take regular pauses in the present. Break the automatic habits to become proactive as opposed to being reactive. Continuing with our previous example, if you burst out in anger, it’s not always possible to analyze the full situation in an instant. So, just pause. Tell everyone you need a moment and do something else to give your mind some time to digest. c) Plan future scenarios in your mind. When you do the previous two steps and you realize what makes you tick, you can plan if-then scenarios in your mind. So next time, you already have a plan in mind for a similar situation. Many times, you will fail to respond appropriately even after planning, but that’s okay as long as you keep repeating the process of analyzing, pausing and planning. This strategy is not limited to anger management, you could manage your stress, addictions, and other bad habits in the same manner. Remember to not judge your emotions. They are natural. They don’t define you. And with practice, you can control them. Since childhood, you’ve been exposed to gazillions of concepts that set the foundation of your subconscious mind. Your past holds a lot of insights about why you do what you do. Visiting your past helps you understand the underlying reason for your desires, values, preferences, thought patterns and emotional reactions. For example, If you grow up in a violent environment, there are high chances of you becoming violent or fearful in the future. But if you recognize the dark sides of your past, you can let go, forgive, heal and move on. But that’s an extreme example. Even small childhood events can have a huge impact that can last for a lifetime if you don’t recognize them. Start by asking questions. Reset your mind and explore possibilities of what you can let go and who you can become. When you have a better understanding of your past, you become free to move with an unstoppable force to create a better future and navigate the world through confidence. Once you explore memories and relationships from your past, start unlearning the mental blocks that are holding you back. Here’s a post I wrote about unlearning common beliefs. To improve your emotional intelligence, you need to understand the wide array of emotions and how to handle them. 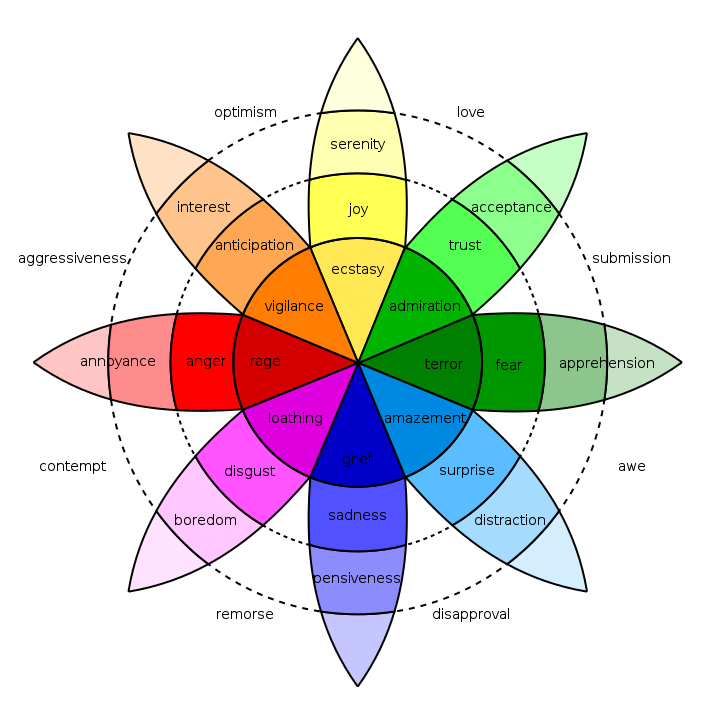 A lot of theorists have identified and categorized emotions in different ways. Here’s one categorization from Robert Plutchik’s theory. Lisa Feldman Barrett, in her book How Emotions Are Made says recognizing different emotions builds what is called as emotional granularity, which means being able to construct precise emotional experiences. People who recognize the different kinds of unpleasant feelings were 30% more flexible when regulating their emotions. They are less likely to drink excessively during stressful times. They are less likely to burst out of anger when someone hurts them. They act appropriately in social situations. They handle fear and anxiety in a better way. To get started, here are a few most common emotions you can start recognizing when you feel them: discomfort, fear, frustration, anger, hurt, guilt, disappointment, inadequacy, overwhelm, and loneliness. To dig deep even further, learn foreign words for emotions to expand your vocabulary so you can recognize the emotions you didn’t even know you had. Here’s a list of emotions which will help you with that. For example, Torschlusspanik (German) is a word for the panicked feeling of time running out. As I learned this new word, I recognized this feeling and chose to handle it in a better way. You can even create new names for the emotions you feel as it helps to remember the feeling so you can deal with them in your own personalized way. The next step after naming the emotions is to recategorize them when you feel them. For example, when your heart races fast because of performance anxiety, reframe the emotion to feeling energized. The reason it works is that you feel the urge to perform well without too much of a negative effect from pro-inflammatory cytokines. Because of that, you feel and perform better. 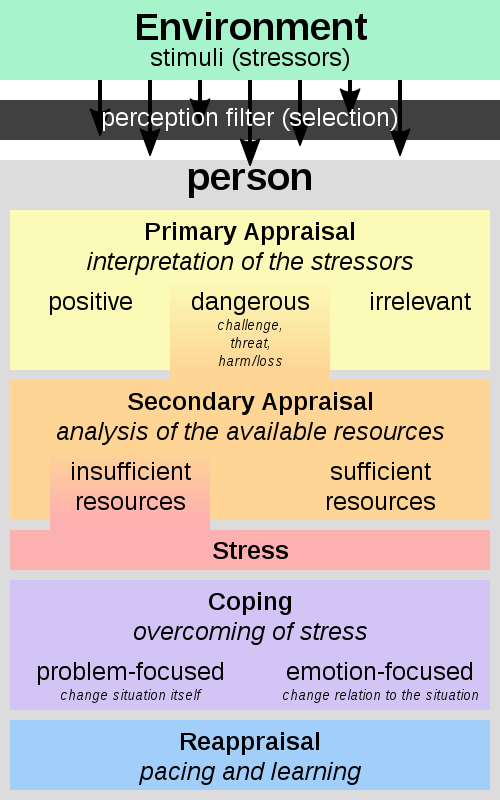 In psychology, appraisal theory suggests that it’s our evaluation that determines the emotional impact of the events on us. It does take time and effort to become good at recategorization (or reappraisal) so be willing to practice and stay patient with this technique. Once you label your emotions, check how intense and urgent they are. Ignoring or distracting yourself from low-intensity negative emotions is easy, but when it comes to intense and urgent emotions, things may get wild in the heat of the moment. To handle negative high-arousal emotions, stop speaking and take six deep breaths. Doing so will activate your parasympathetic system (rest and digest response) as opposed to the sympathetic system (fight or flight response). I’m not saying you should suppress your emotions as it may lead you to choose an unhealthy outlet for expressing emotions such as smoking or aggressive behavior with others in general. This, in turn, may increase your mortality rate as found in this study. So what do you do instead? You may either find a healthy outlet for expressing your emotions like exercising for expressing anger, talk to yourself in the third-person or write it out. In her book, Emotional Agility, Susan David suggests writing your emotions is one of the best ways to deal with emotions. Ancient wisdom also supports this idea and suggests to write a letter to someone and burn (or delete) it. And if you need to express an emotion that doesn’t harm anyone, be open about it and let your emotions come out. Lastly, learn to prevent undesirable life situations so you can focus on better things such as your goals, relationships and yourself. Take care of your wellbeing by staying physically active and eating right. Be in good relationships and avoid toxic ones. Work on yourself and your skills to develop natural confidence. Manage your time and energy better. Stay in a good mood overall by managing your neurotransmitters. Train your mind with powerful mindset. Approach everything with a beginner’s mind and treat every human as an opportunity to look at things from a new perspective. The more perspectives you collect, the more you realize how small your point of view really is. To expand your perception and knowledge, you must observe and listen. I used to think I’m a master of self-awareness. I thought I knew myself from inside out. But then the harsh reality hit me when I realized how little my self-knowledge really is. How did I realize it? When I got honest feedback from a lot of acquaintances about how they perceive me. I was shocked and I realized whatever they had to say was not wrong at all. You can’t argue with other people’s opinion of you. Since then, I often ask my friends to give me feedback so I can get to know myself a little better. What do you think is the most annoying thing about me? What do you think is my greatest strength? What do you think I can improve that will benefit me a lot? How do you think I handled the situation? Could I do a better job? How did you feel when I said (or did) [something]? The insights I get are profound. I don’t think I would ever get those insights by reflecting in my journal. Another reason to ask people (instead of assuming) is that in general, we are pretty bad at guessing people’s thoughts, feelings, attitude or mental state. According to the researchers from the Ben-Gurion University of the Negev, the University of Chicago and Northeastern University, relying on instincts isn’t an accurate way to determine what the other person is thinking or feeling. Another study concluded that we perceive other people’s emotions based on our current feelings — which is not always an accurate perception of other’s emotions. Of course, you can’t ask what people are thinking or feeling all the time. But you can try clarifying as much as possible instead of assuming especially when it matters the most. There are two main types of communication — verbal and non-verbal. Listen to others. Instead of thinking about what to say next. Make people feel safe by showing similarity and kindness. Be vulnerable by not being afraid to share yourself with others. Explain thing simply so people want to listen to you. Communicate your needs in a kind way. Keep a good posture to feel confident. Read people by paying attention to their body language and facial expressions. Other than that, follow the basics — be honest, open, agreeable and kind. Being honest means expressing yourself truly while also controlling your emotions. Suppressing emotions or not controlling them may harm you or the other person. Some people speak their minds because they want to be honest, while some people tell lies openly. Both kinds of people lack emotional intelligence. Liars lack empathy and social skills because they don’t realize the impact of their lies on people or because they can’t communicate in hard situations. Brutally honest people adopt a philosophy of — “I want to be 100% honest and speak my mind”. This sounds good, but sadly, it’s just a sign of low emotional intelligence. Emotionally intelligent people are better at predicting when to say what. They tell the truth, but with love and kindness. They consider the relationship they have with the other person to tailor what and how to communicate. Stay open to new ideas and be quick to change your mind. It’s okay if you’re wrong or when you agree to disagree with someone. Communicating well is especially important today in the digital world. Emails and text messages don’t convey our body language or facial expression. What you write may not be perceived as exactly what you mean so you want to be extra attentive to how you convey your message in written words. Finally, there is one more way to communicate other than verbal and non-verbal. Can you guess what that is? When you give your time, effort, and energy to others, you say a lot without speaking a single word. Genuine care and love shows. You can’t fake it for too long. I can’t finish talking about communication without mentioning the importance of empathy. Empathy is the ability to see things from other’s perspective and relate with them on an emotional level. Empathy is the cure of harsh judgment we throw at people. It keeps humanity alive. But empathy is not easy. In fact, it’s a tradeoff. Empathy requires a sacrifice. A sacrifice of losing your positive feelings because you need to go all in and feel what the other person is feeling. Because otherwise, it’s sympathy, not empathy. Brené Brown does a great job at explaining the difference between empathy and sympathy in this video. This tradeoff may not be best for your emotional state, but it may be our only way out because we need other humans for the collective emotional well-being of humans. It seems like being emotionally intelligent solves all the problems in the world. The more emotionally intelligent you become, the more you realize how much you and especially other people lack emotional intelligence. It’s a good thing when you realize your own mistakes because you can fix them and improve your intelligence. But when it comes to others, you can’t directly make people intelligent. You may get annoyed or sad because of their lack of self-awareness, self-management, motivation, empathy or social skills. That’s when you get the chance to become more emotionally intelligent as you can practice your empathy skills and deeply understand people without judgment. They may be wrong, but at least you understand their psychology. Don’t expect people to be intelligent all the time (including yourself). Humans make mistakes. One of the humblest things you can do as an emotionally intelligent person is to accept mistakes (whether they are yours or others). And when you meet people who lack emotional intelligence, lead by example and hope the best for them. Imagine if we all work on improving our emotional intelligence. We would feel negative emotions, but we’ll accept them and use them for the good. We would follow self-improvement, but we won’t become self-absorbed. We would argue, but we won’t become violent. And I believe, the world would be a better place.